Psychology Today Magazine Loves White People. Especially Beautiful and Thin White Women. Psychology Today is a popular magazine focused on pop psychology. Every other month, they release a print magazine and send out tens of thousands of copies to therapists and counselors across the country who are signed up with their online therapist directory. They also sell the magazine at grocery stores and newsstands. These magazines litter almost every single therapy waiting room. I’m a therapist myself. I run a few counseling centers. They are in my waiting rooms. But I’ll be throwing them in the trash the next time I go to work. And here is why: Psychology Today is shamefully lacking in diversity. Over the years, I’ve talked about this lack of diversity anecdotally with other therapists. There is a general feeling, in the mental health community, that young, white, models were gracing the cover of the magazine at an incredibly high rate. But I wondered how bad it really was. So I took some time to go back through their archives and analyze the diversity featured over a period of twenty-six years. The results were truly staggering. I created an infographic illustrating the results. You can check out the data at the bottom of this blog. It’s pretty stunning. 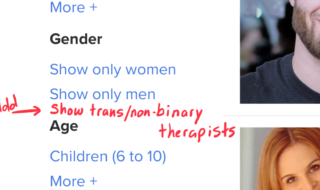 Full disclosure: I recently launched an all inclusive therapist directory that has a mandate to fight racism, homophobia, transphobia and all other forms of discrimination. The online directory is in direct competition with Psychology Today’s directory. I think Psychology Today’s therapist directory has a lot of problems. TherapyDen addresses those problems and is a lot better. But that’s just my opinion. If you’re looking for a therapist, start here. If you are a therapist and you want to join for free during launch, start here. I will point out real quick that Psychology Today (the directory) is based in the Cayman Islands, which means there is a real good chance they don’t pay their taxes. I wrote a bit about that here. I only mention that because it seems to fit their identity. Which is lacking. The magazine appears to be based in the US, but is closely connected with the directory. Since January 1992, Psychology Today has published 161 magazines. The vast majority of issues featured people on the cover. Of the 161 issues, only 12 of them did not have people on the cover. 9 of the 12 were illustrations or graphics. Two of them pictured animals, a goat and a monkey. And one of them featured Marge and Homer Simpson. Of the 149 people featured on covers, 143 of them are white people (!!!). Only six of the covers included people of color. Over 95% of people on the covers are white. Does that not seem like a really high rate? Is there no one at Psychology Today suggesting more diversity? I will say that it does seem like they include people of color inside the magazine at a greater percentage. Which isn’t hard to do when they barely feature them on the cover. So that’s something? I guess? Every single person (in their digital archive) that has graced the cover of Psychology Today has been thin. Every. Single. Person. Zero plus-sized or fat people have been featured on covers. Well, I guess there is the one caveat that I mentioned before where a skinny woman is sad about imagining herself as a fat woman. But that does’t really count. I want to see bodies off all shapes and sizes represented as normal (which, btw, they are!). And also men! Where are all my guys at? They are barely there at all. Men have only been featured 6 times by themselves. And all of them, except maybe Sigmund Freud and the Dalai Lama, were fit dudes. So much for breaking the stigma of men being into therapy I guess. Body positivity is trending more than ever right now. But we in the psychology field have been celebrating health at every size for an incredibly long time. We are basically the originators of accepting your body at every weight and shape. It’s a real shame that the most popular magazine in the mental health field has never featured a fat person looking and feeling good about their body on the cover of their magazine. Psychology Today is, at best out of touch or, at worst, purposefully perpetrating damaging, media-reinforced, stereotypes promoting unrealistic, unrepresentative bodies as the “ideal.” Either way it’s disgusting. As you can imagine, the only people that are on the covers are people that fit the western standard of beauty. Incredibly symmetrical, young, thin, fit, photoshopped women, and a few men, are featured. Of the 161 magazine covers I viewed, only two people did not meet traditional western beauty standards. And those two were Sigmund Freud and the Dalai Lama (sorry guys). And they are both men who are famous figures. So that’s probably why they got a pass. I get that selling magazines has had something to do with putting pretty people on the cover since the beginning of time. I’m not an idiot. I know how these things work. But I would challenge us all, especially those of us in the mental health field, to do better. Call me crazy, but when publishing a magazine designed to make psychology interesting and approachable for the masses, why not represent the masses? I think you can feature diverse faces, colors, ages, abilities and bodies still sell magazines. Also, you can show a range of beautiful and interesting looking people on the cover — but maybe just don’t keep going for the generic model look over and over and over. It’s a real missed opportunity not to feature normal people every now and then. Maybe Psychology Today could feature cutting edge psychology professors across the country? I dunno. Just an idea. 88% of the time the cover features only white people. An animal is featured on the cover more often than a Black person, a Latinx person, a Muslim person and any other ethnicity besides Asian. An Asian person is featured just as much as an animal. Twice. Psychology Today favors a “beautiful” white woman over anything else to a stunning (and disgraceful) degree. Despite my amazing investigative journalism skills, I’m definitely not the first person to point out how Psychology Today needs to do better. You can find plenty of other people commenting on their cover images. Like <="" span=""> that points out how a cover last year was sexist. Which it was. And tons of therapists have been talking about it for years. It hasn’t gone unnoticed. But like so many other things we are experiencing at this particular, unique moment in history, I’m sick of it. So what can you do? Well, you can cancel your Psychology Today profile subscription….I did it awhile ago and let me tell you, it’s truly liberating. Look, I know Psychology Today is one of the best ways to get client referrals right now (I’m really hoping <="" span=""> will change that), so if you can’t quite bring yourself to quit at the moment, I totally get that. 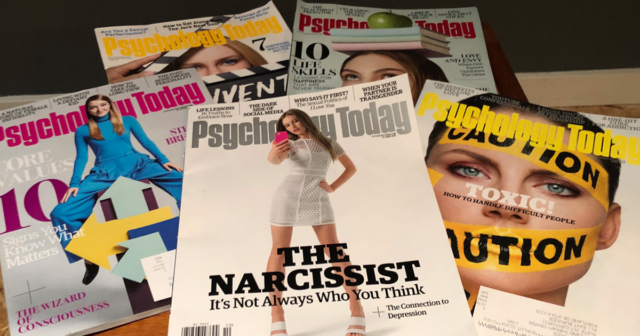 If you aren’t ready to cut ties, email Psychology Today and ask them to stop sending you the magazine (therapist@psychologytoday.com) that comes free with your profile listing. Tell them you want more representation in their publication and until that happens you’d rather not receive the magazine at all. You can also join and support other therapist directories (even if you stay on Psychology Today) that promote a more inclusive and diverse approach to mental health. <="" span=""> happens to be one of those directories (and did I mention it’s free to sign up with TherapyDen now?). Joining a site like TherapyDen will help that site move up in the rankings and eventually compete with Psychology Today for client referrals. There is also likely at least one local therapist directory you could support in your own town or city. If you’re not a therapist, you can do other things. You can use a different site to find a therapist. You can stop buying the magazine. You can educate your own therapist about the covers if they leave them in the waiting room. And you can contact their editor in chief to ask for more diversity. You can also share this infographic on social media so that Psychology Today can take notice and do something about adding more diversity.